Turbidity is a measure of a water’s clarity or murkiness and is often the result of dredging activities. The most common method of turbidity control involves the use of a "boom" constructed with a foam-filled flotation cell attached to the top of a vertical filtration curtain. The curtain is anchored at the bottom by chains, anchors or sand-filled anchor tubes. Caribbean GeoTextiles offers Contractor Floating Turbidity Curtains as well as Fast Deployment Reel Oil Containment Booms. 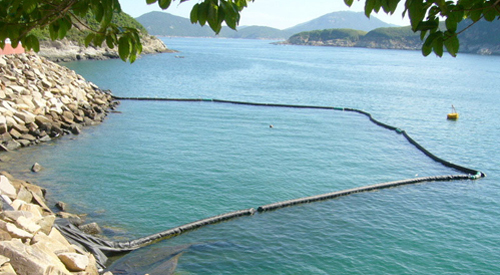 Our Floating Turbidity Barrier Products consist of DOT compliant Type 1, 2 & 3 Floating Turbidity Barriers, Dredging Barriers, Baffles and Ditch Barriers. Caribbean GeoTextile Products also offers Oil Containment Products consisting of Fast Deployment Reel and Standard foam filled oil containment booms for marinas, rivers, ports, offshore, etc. Contact us to learn more. Trinidad & Tobago, Antiqua, Turks & Caicos, Bahamas, Puerto Rico, Aruba, Virgin Islands, Cayman Islands, Jamaica, Grenada, Bonaire, Caracao, Guadeloupe, Martinique, Barbuda, Dominican Republic, St. Lucia, Belize, Costa Rico, Honduras, Nicaragua.